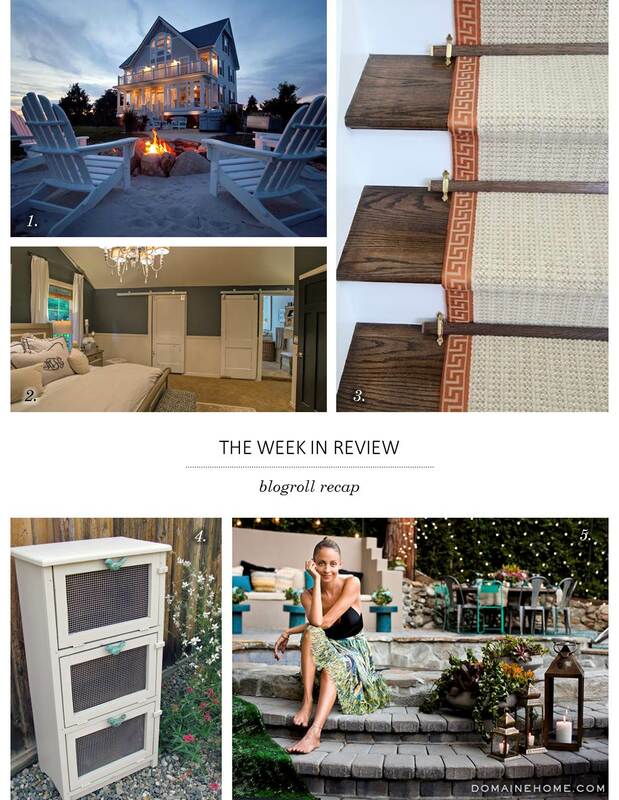 Here’s my favorites from the blogging world for you to peruse over the long weekend! Enjoy! The DIY Network’s blog Made+Remade featured some incredible stone fire pit inspiration pics. There’s no denying it- fire pits rock. But a fire pit on the beach is simply the best. Melanie from My Sweet Savannah completed her dreamy master bedroom makeover. I’m completely jealous of her barn doors into a closet and bathroom. How fun! Paloma from La Dolce Vita pondered different options for her client’s stair runner. We’re not planning on a runner in our home but this pic above with its lovely tie downs definitely got my attention. Future project? Ashley from Rustic Living turned a simple wooden side table into an adorable piece all designed around those cute bird pulls. HGTV’s blog Design Happens made me really want an invitation from Nicole Richie to a backyard barbecue. I’ll bring the veggie burgers Nicole! This entry was posted in The Week in Review and tagged blog. Bookmark the permalink.